The standard therapy regimen of conventional osteosarcoma includes neoadjuvant chemotherapy followed by surgical resection and postoperative chemotherapy. The percentage of necrotic tissue following induction chemotherapy is assessed by using the Huvos grading system, which classifies patients as “poor responders” (PR) and “good responders” (GR). The aim of this study was to identify molecular markers expressed differentially between good and poor responders to neoadjuvant chemotherapy in order to predict the response to chemotherapy in conventional osteosarcomas before beginning treatment. Suppression Substractive Hybridization (SSH) was performed by using cDNA from frozen biopsy specimens. Expression of selected relevant genes identified by SSH was validated by using QRT-PCR. Immunohistochemistry (IHC) on tissue microarray (TMA) sections of 52 biopsies was performed to investigate protein expression in an independent cohort. ERK1 and STAT3 mRNA level were significantly different between PR and GR in an independent cohort. Phosphorylated STAT3 and ERK1 expressions by IHC on TMA were correlated with poor response to chemotherapy. Our results suggest that ERK1 and STAT3 expression are good predictive markers for chemotherapy response and that inhibitors might be used in combination with common chemotherapeutic drugs in conventional osteosarcomas. Osteosarcoma, the most common type of primary bone cancer, is a rare disease. Approximately 900 new cases of osteosarcoma are diagnosed each year in the United States (http://www.cancer.org/docroot/home/index.asp) and 200 in France, including 150 in children (http://www.fnclcc.fr/sor/SSP/CancersEnfant/PeauTissusSoutien/Osteosarcome). Adjuvant and neoadjuvant chemotherapy have significantly improved the long-term survival rate for patients with osteosarcoma [1–3]. Nevertheless, recurrent disease still occurs in about 30–40% of patients and more than 70% of them die of their tumor, despite second-line treatment. The standard therapy regimen of high-grade osteosarcoma includes induction by multiagent chemotherapy followed by surgical resection and postoperative chemotherapy . The percentage of necrotic tissue following induction chemotherapy is classified with the Huvos grading system . Patients with <90% tumor necrosis following induction therapy are classified as “poor responders” (PR) or Huvos grade I/II , while more than 90% necrosis corresponds to Huvos grade III and complete necrosis to Huvos grade IV. Good responders (GR) correspond to Huvos grade III/IV. The degree of necrosis remains the only reliable prognostic factor for the patients presenting with localized disease and is used to guide the choice of postoperative chemotherapy. Numerous clinical trials have attempted to increase the disease-free survival rate for poorly responding patients with intensified postoperative therapy. No survival benefit has been convincingly shown through the administration of more intensified therapy to poor responders [3, 7–10]. This suggests that there may be an innate biological difference between good responsive and poor responsive tumors. Previous transcriptomic studies have shown that in chemoresistant tumors, the genes involved in osteoclastogenesis, extracellular matrix remodeling, bone development, tumor progression, drug resistance and angiogenesis are up-regulated [11–17]. However, none of these molecular predictive factors can be used routinely. Therefore, there is a need to establish reliable predictive biomarkers for the response to chemotherapy at the time of diagnosis. The aim of this study was to identify molecular markers expressed differentially between “good” and “poor” responders to neoadjuvant chemotherapy in order to predict the response to chemotherapy in conventional osteosarcoma before beginning treatment, and to elucidate the mechanisms involved in this response. We identified several subsets of novel potential candidate genes. In particular, our data suggest that ERK1 and STAT3 expression are involved in the response to chemotherapy and that they could be therapeutic targets. The response to preoperative chemotherapy was assessed on resected specimens according to Rosen’s protocol . To identify differentially expressed genes between “good” and “poor” responders (GR and PR) to chemotherapy, Suppression Subtractive Hybridization (SSH) was performed by using cDNA from frozen biopsy specimens taken for diagnosis prior to treatment. SSH was performed by using 5 samples of GR patients (three males and two females, mean age 14 years) and 4 samples of PR patients (two males and two females, mean age 13.5 years). All patients received preoperative and postoperative chemotherapy derived from the SFOP OS 94 regimen . Clinicopathological characteristics of the patients studied by SSH are presented in Table 1. The two groups were similar in tumor volume, tumor location and histological subtype. Expression of selected relevant genes identified by SSH was validated by using real-time quantitative RT-PCR (QRT-PCR). For QRT-PCR, the same specimens and additional specimens of 22 patients were obtained. The whole cohort consisted of 13 GR and 18 PR. 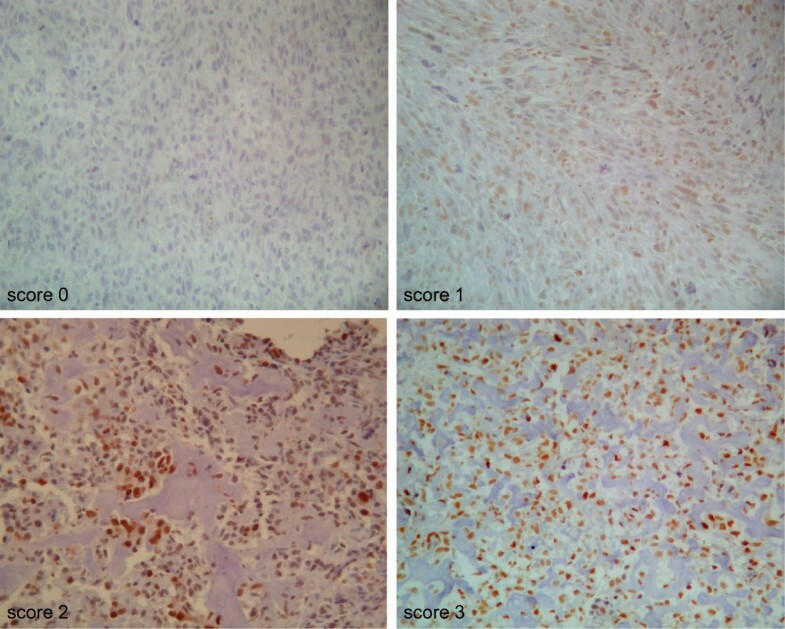 Immunohistochemistry (IHC) was performed on Tissue Microarray (TMA) sections consisting of 52 biopsies of patients with a conventional osteosarcoma. Six of 9 samples used for SSH were used for TMA. 18 of the 31 samples used in QRT-PCR were used for TMA. In total, among the 52 patients in the TMA validation cohort, only 5 received chemotherapy without high-dose MTX. The vast majority of patients (40) were those treated according to protocol OS94 or by neoadjuvant chemotherapy with methotrexate, vepeside and ifosfamide. All samples were obtained after informed consent from patients or their parents when the patients were under the age of 18. Research involving the patients have been performed with the approval of Protection of the Person Center: CPP sud Méditerranée 1 ethics committee (authorization number: DC-2008-309) in compliance with the Helsinki Declaration. Samples were from a tumor bank that respects the ethical charter of the French National Cancer Institute (AP-HM Biobank authorization number 2013-1786). Total RNA extraction was performed from frozen tumor specimens by using the acid guanidinium isothiocyanate/phenol/chloroform procedure. Before use, RNA samples were treated with 10U ribonuclease-free deoxyribonuclease (Promega, France) at 37°C for 15 min. Tests for purity and quality were performed on a nanodrop spectrophotometer and the Agilent 2100 Bioanalyser RNA LabChip kit (Agilent Technologies, Palo Alto, CA, USA) [19, 20]. Only samples with RNA integrity Number (RIN) > 7 and no evidence of ribosomal degradation were included. Poly(A) + mRNA were isolated from GR and PR total RNA using an Oligotex mRNA isolation kit (Qiagen, France) and gene expression between these two mRNA populations was compared by SMART-SSH using a Super PCR cDNA Synthesis Kit for cDNA synthesis (Clontech) and a PCR-Select cDNA subtraction kit (Clontech), a principle previously described by Diatchenko et al. .
Products from the final PCR amplification were cloned into a Topo TA cloning vector (Invitrogen Life Technologies, France) and electro-transferred into One Shot E. coli. Differential screening was performed to eliminate false positives. Hybridizations were performed in duplicate according to standard procedures. Specific clones were prepared by using a Qiagen plasmid mini-kit and sequenced (QIAGEN France SAS, Coutaboeuf, France). Nucleic acid homology searches were carried out with the BLAST program at the NCBI, USA. QRT-PCR was used to accurately detect the changes of expression of selected relevant genes: ERK1 and STAT3 gene expression levels and ribosomal 18S RNA as reference sequence. Total RNA (1 μg) DNA-free was reverse-transcribed into cDNA using hexamers (Pharmacia Biotech, Orsay, France) and Superscript II Reverse Transcriptase (Invitrogen Life Technologies, France). Genes of interest and 18S rRNA were amplified, detected and quantified in real-time by using the Light Cycler Real-Time PCR (Roche Applied Science, Meylan, France). QRT-PCR was performed by using the oligonucleotides and sequence parameters described in Table 2 in a medium containing 1X LightCycler 480 SYBR Green I master mix, 0.25 μM of each primer and 20 ng of cDNA. Each PCR reaction was preceded by one activation cycle of 95°C for 5 min and ended by establishing a melting curve 5 degrees above the oligonucleotide melting temperature. Automated immunohistochemistry was performed on slides of TMA paraffin blocks. The 52 tumor specimens were all fixed in 4% formalin. Fleshy tissue was separated from calcified areas to avoid unnecessary decalcification. When necessary, tumor specimens were decalcified in a solution of 22% formic acid. TMA were prepared as previously described . For each sample, three representative sample areas were carefully selected from a hematoxylin–eosin-stained section of a donor block. Core cylinders with a diameter of 1 mm each were punched from three representative areas and deposited onto two separate recipient paraffin blocks by using a specific arraying device (Alphelys). To determine the expression of activated forms of STAT3 and ERK1 proteins, we used anti-phospho-STAT3 (Tyr705) (polyclonal, 9131 from Cell Signaling Technology, dilution 1/20) and anti-phospho-ERK1 (polyclonal, clone 20G11 from Cell Signaling Technology, dilution: 1/100) antibodies. Automated IHC was performed with a Ventana automate (Benchmark XT, Ventana Medical Systems SA, Illkirch, France). Positive external control was a glioblastoma for both pSTAT3 and pERK1. Negative controls were also included and corresponded to omission of primary antibody or irrelevant antibodies of the same isotype. IHC was scored positive when nuclear staining was observed. A semi-quantitative analysis was done for positive specimens without knowledge of clinical data. Percentage of stained cells and staining intensity (weak, moderate, high) were taken into account to obtain the score. Score 0 was attributed to tumors with absence of staining. Score 1 was attributed to tumors with low intensity of staining whatever the number of stained nuclei or to tumors with no more than 25% of nuclei immunostained with moderate intensity. Score 2 corresponded to stained nuclei numbering between 25% and 50% with moderate intensity or to fewer than 25% of stained nuclei with high intensity. Score 3 was defined as either more than 50% of stained nuclei with moderate intensity or more than 25% of stained nuclei with high staining intensity. A mean score was proposed for the three areas of each tumor. Three independent observers evaluated the IHC results blind to clinical data. A consensus score was reached and statistical analysis was performed from the consensus score. Relationships between response to chemotherapy (GR vs. PR) and other parameters used were obtained by using non-parametric tests, the Fisher exact test and the Mann-Whitney test when qualitative and continuous respectively. All tests were two-sided. P-value was considered significant when ≤ 5%. SAS System version 9.2 (SAS Institute Inc., Cary, NC) and Stata software (version 10.1 Special Edition, StataCorp, College Station, Texas) were used to perform data analyses. Clinicopathological characteristics of the patients studied are presented in Table 3.
aConfidence Interval, for the whole cohort, to ascertain that the screening cohort is a representative subset of the whole. bOsteoblastic and chondroblastic or fibroblastic. A subtractive cDNA library of PR was generated. 126 selected clones were sequenced (Table 4). The following genes were selected on the basis of their known roles in tumorigenesis or chemoresistance: ACTN1, AKT2, ANXA2, CADM1, CDKN2C(P18), FN1, GAL1, HRAS, IGFBP3, LMNA, ERK1 and STAT3. Particularly, STAT3 is a key factor for chemosensitivity in human epithelial ovarian cancer cells and thyroid cancer-derived CD133+ cells [22–24]. Recent studies show that ERKs may also be activated in response to chemotherapeutic drugs, and pERK1/2 played critical roles in drug resistance [25–28]. Thus, these selected genes were tested by QRT-PCR. Only STAT3 mRNA level and ERK1 mRNA level were significantly different between PR and GR. Quantification of STAT3 and ERK1 mRNA transcripts revealed higher mRNA levels in PR compared to GR samples (p = 0.019 and p = 0.046 respectively). The mean level of STAT3 mRNA was 0.820 [0.280-13.970] in PR versus 0.310 [0.230-2.370] in GR samples (Figure 1A) and the mean level of ERK1 was 0.270 [0.110-4.340] in PR versus 0.150 [0.088-0.710] in GR samples (Figure 1B). RTQ-PCR analysis of STAT3 and ERK1 genes. A: Quantification of STAT3 mRNA with 18S rRNA reference gene transcript confirmed higher STAT3 mRNA levels in poor responder (PR) samples compared with good responder (GR) samples (p = 0.019). B: Quantification of MAPK3 (ERK1) mRNA with 18S rRNA reference gene transcript confirmed higher MAPK3 (ERK1) mRNA levels in PR samples compared with GR samples (p = 0.046). IHC pSTAT3 scores. Score 0: negative staining (X200). Score 1: >50% of nuclei are labeled with low staining intensity (X200). Score 2: <50% cells with moderate staining intensity and <25% of cells are highly stained (X200). Score 3: more than 50% of nuclei are stained with moderate staining intensity (X200). SSH is a molecular biology technique that enables the identification of differentially expressed genes between two groups with high sensitivity. By comparing PR to GR prior to chemotherapy among patients with an osteosarcoma, we found 126 clones. ERK1 and STAT3, the genes selected on the basis of their roles in tumorigenesis or chemoresistance, were further studied by QRT-PCR in an independent cohort. ERK1 and STAT3 expressions assessed by QRT-PCR and IHC were significantly linked to the response to chemotherapy. The protein encoded by ERK1 is a member of the MAP kinase family and acts in a signalling cascade that regulates various cellular processes such as proliferation, differentiation, and cell cycle progression in response to a variety of extracellular signals. We found ERK1/2 positivity score by IHC and ERK1/2 IHC high score (score 2 and 3) in 78% and 51% of our cohort, respectively. These results suggested that ERK1/2 pathway could be involved in osteosarcoma as it has supported by Pignochino et al. study that showed activated ERK 1/2 pathway in 66.6% of osteosarcoma samples. Moreover, the same team also showed that Sorafenib, a tyrosine kinase inhibitor, blocks tumor growth, angiogenesis and metastatic potential in preclinical models of osteosarcoma through a mechanism potentially involving the inhibition of ERK1/2. No attempt to investigate the link between ERK1 expression and response to chemotherapy was made in vivo. However, our work suggested that ERK1 could be involved in drug resistance as reported recently by Si et al. with an approach by RNAi-mediated knockdown of ERK1/2 inhibiting cell proliferation and invasion and increasing chemosensitivity to cisplatin in human osteosarcoma U2-OS cells in vitro . STAT3 is one of the transcription factors reported to play an important role in tumor survival, proliferation, angiogenesis and metastasis. In normal cells, STAT3 is activated transiently to maintain homeostasis. However, if STAT3 continues to be activated, the abnormal level of expression can trigger oncogenic pathways. Aberrant active STAT3 promotes uncontrolled growth and survival through dysregulation of expression of downstream targeted genes including survivin, Bcl-xL, Bcl-2, Mcl-1, c-Myc and cyclin D1. Constitutive activation of the STAT3 pathway has recently been shown in several malignancies, especially osteosarcoma . It has recently been implicated in resistance to chemotherapy-induced apoptosis . Furthermore, activation of STAT3 in several cancers has been found to be correlated with clinical outcome especially in osteosarcoma. A high level of expression of STAT3 by IHC in 76 biopsies of patients with an osteosarcoma was a poor prognostic factor for both overall survival and disease-free survival in univariate and multivariate analysis . High staining with pSTAT3 was also of prognostic value in another series of 51 conventional osteosarcomas . In addition, inhibition of STAT3 plays a role in proliferation, apoptosis and migration in osteosarcoma cells in vitro. The down-regulation of STAT3 by miR-125b suppresses in vitro proliferation and migration of osteosarcoma cells . STAT3 inhibition by RNA interference induces inhibition of proliferation and apoptosis enhancement in osteosarcoma cells . The novel curcumin analog FLLL32 decreases STAT3 DNA binding activity and expression, and induces apoptosis in osteosarcoma cell lines . The small molecules, LLL12 and FLLL32, inhibit STAT3 phosphorylation and exhibit potent growth suppressive activity in osteosarcoma cells and tumor growth in mice . In contrast, oncostatin M promotes STAT3 activation, VEGF production, and invasion in osteosarcoma cell lines . Finally, STAT3 is involved in drug resistance in osteosarcoma cell lines. Ryu et al. recently showed that the STAT3 pathway was overexpressed in MDR osteosarcoma cells and that inhibitors of STAT3 such as CDDO-Me could reduce resistance to doxorubicin in these cell lines . In our study, we have showed an expression of pSTAT3 in 58% of cases. This activated STAT3 pathway was correlated to poor response to chemotherapy. Thus, our results are consistent with the results of the literature in vitro through the analysis of patient samples. The effects of EGFR are mediated by activation of downstream signal transduction cascades that include Janus tyrosine kinases (Jak), Signal Transducers and Activators of Transcription (STAT), Phophatidyl Inositol 3 Kinase (PI3K)/Akt and Ras/RAf/MAP kinase (ERK). The prognostic value of EGFR and its downstream signaling molecules such as STAT3 and ERK1 have been studied in many tumor types. Only one study  simultaneously examined the status of EGFR and four downstream molecules - pSTAT3, pERK1, pAkt, survivin - by IHC in 47 samples of conventional osteosarcomas. ERK1 and survivin expression were statistically correlated with survival. A high expression was negatively correlated with prognosis. Furthermore, EGFR expression was correlated with expression of ERK1 and it was observed a significant association of survivin expression with STAT3 and ERK activation. These results and ours support the idea that ERK is a downstream signaling molecule of EGFR and also suggest a link between the EGFR signaling pathway and drug resistance through ERK1 and STAT3 expression in conventional osteosarcoma. We have shown that high pSTAT3 and pERK1 expression in the biopsies are suggestive of poor response to chemotherapy. The elevated positive predictive value of high score of both pSTAT3 and pERK1 in combination (91%) highly suggests that IHC test could be used at the time of diagnosis to stratifying patients enrolled in randomized trials. Our results also suggest that STAT3 and ERK1 inhibitors might be used in combination with common chemotherapeutic drugs in osteosarcoma in order to increase the response to chemotherapy and to improve the prognosis. Finally, other genes identified by SSH remain to be explored and a prospective validation phase on a larger cohort is still needed before these biomarkers could be used in clinical practice. We are grateful to R. Cooke for editing the English. Samples were collected and stored in the Assistance Publique des Hôpitaux de Marseille tumor bank (Tumor Biobank authorized nb AC-2013-1786.). This study was supported by grants from “projet libre INCA recherche Biomédicale 2010. Conceived and designed the experiments: SS, CJJ, CB. Performed the experiments: CJJ, CB, CB, FF, AP, FF. Analyzed the data: SS, LC, PJ. Contributed reagents/materials/analysis tools: SS, JLD, JCG. Wrote the manuscript: SS, CJJ. All authors read and approved the final manuscript.